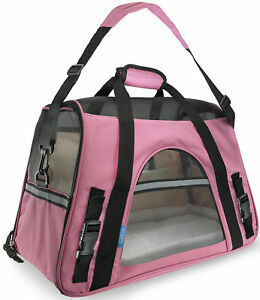 Help your pet travel in style with a soft-sided rose wine pink nylon pet carrier. Designed to keep small dogs and cats safe during long plane flights, this airline-approved carrier is lightweight and easy to carry. It has meshed sides to keep your furry friend cool during the flight. A fleece-lined bottom makes for a comfortable bed during the flight.